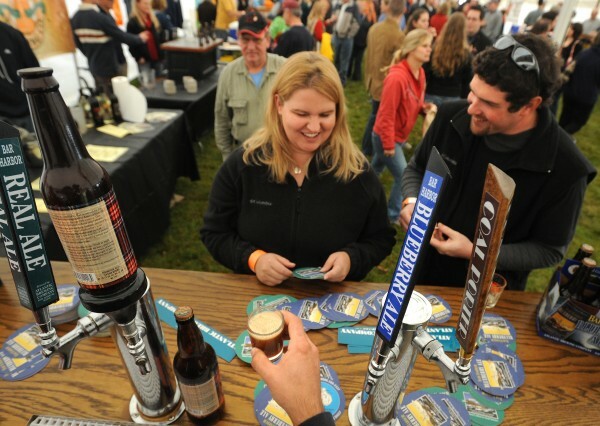 Jessica Wentworth-Genthner (center) waits to sample some beer with her then-friend Stephen Genthner of Round Pond at the 14th annual Oktoberfest in Southwest Harbor in October 2009. Wentworth and Genthner were married Sept. 25, 2010. Brewers and beer enthusiasts from across the state gathered to celebrate and taste the craft beers of Maine at the Bangor Beer Festival on Saturday, June 22, 2013. PORTLAND, Maine — Maine beer festival organizers are calling for changes in the laws that regulate their events after a shortage of volunteers — required by the state, they said — marred an international beer event in Portland over the weekend. Entry to the Saturday evening session of The Festival, a Shelton Brothers event that drew brewers from around the world, was reportedly delayed for at least a half hour because not enough volunteers showed up to pour beer samples. Mak Sprague, who organizes the annual Labor Day Weekend Portland Brewfest and whose family owns the Portland Company Complex building where The Festival took place, said he was among those who “went into serious damage control” and helped call in volunteers to fill in the shortage. 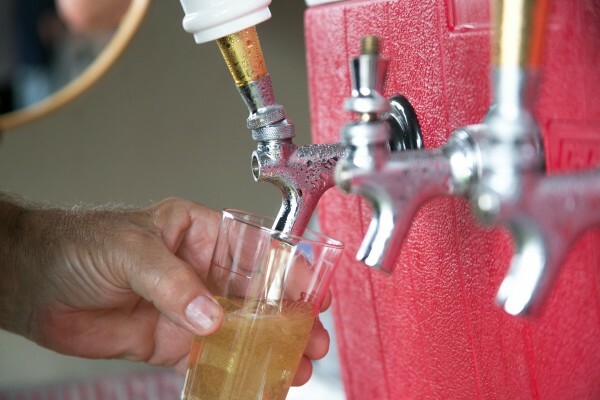 The hitch caused The Festival organizer Dan Shelton to criticize the state law restricting brewers from pouring their own samples during festivals, a regulation he blamed for unnecessarily driving up his need for volunteer pourers. He said he needed to have 80-plus volunteers, one at each booth, and wasn’t sure how many he was short by when organizers realized they needed to scramble to add more. “Maine is a great beer state and Portland’s a great beer town,” Shelton said. “We were all enthusiastic about Portland, but then we started to learn about these laws, and that’s when it started going sour for us. He also bristled about the fact that state regulators insisted that his festival censor beer labels from a Danish brewer that included an expletive. Shelton also argued against a Maine law capping the amount of beer festival-goers can consume over a four-hour stretch at 48 ounces. Daniel Kleban, owner of the Freeport-based Maine Beer Co. and president of the Maine Brewers’ Guild, echoed that sentiment, saying brewers are “well-versed” in knowing when consumers should be cut off, and that festival attendees are thoughtful aficionados who aren’t looking for a “frat party” atmosphere. Kleban said the 48-ounce limit, which is most often monitored by selling tickets for one- or two-ounce tastings, is unnecessary and drives costs up on organizers. The Festival was the first of what will be eight beer festivals in Maine this summer and fall, up from just three as recently as four years ago. That growth has given festival organizers some leverage in seeking changes in the state laws that regulate their events. The guild backed a bill by state Sen. Justin Alfond, D-Portland, this legislative session that increased the number of festivals a brewer could annually participate in from one to five. That bill, which Gov. Paul LePage allowed to pass into law without his signature, will overwrite the previous law which forced Maine brewers to pick one festival each year to support. Now, in the aftermath of The Festival’s volunteer shortage, Kleban said festival organizers hope to push for more updates to the regulations. The requirement forcing volunteers to pour the samples and the 48-ounce limit over four hours are among those brewers have their sights set on, he said. “I think those rules probably had a purpose when they were enacted, but I also think they’re a little bit dated,” said Tim Lo, executive director of Bangor’s KahBang Festival, which on Aug. 10 will include the second annual Bangor Brew Fest. In the case of The Festival, an international event that local tourism officials expected to generate at least $750,000 in economic benefit for Greater Portland, Sprague said it was a missed opportunity to put Maine’s beer community on the worldwide map. A call placed to the Liquor Licensing & Compliance Unit with the Maine Department of Public Safety Monday was not returned by press time. In the wine industry, the rules are similar. Bettina Doulton, owner Cellardoor Winery in Lincolnville was not surprised to hear about the brouhaha at The Festival.